For years, even before the financial meltdown of 2008, the goals of strengthening the nation’s economy and improving the jobs situation topped the list of the Pew Research Center’s annual poll of the public’s top priorities. (You can track the priorities back to 2002 using our interactive). Other pollsters, like Gallup, reported similar findings over that time span. 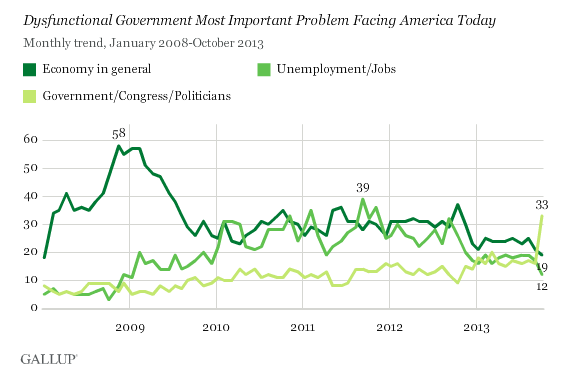 Gallup said that the economy and jobs as the nation’s top problem had already been declining this year. But, in its survey conducted Oct. 3-6, Americans who mentioned some dissatisfaction with government leadership as the top problem doubled to the 33% mark, compared to 16% last month. The survey found Democrats (36%) and independents (33%) as more likely than Republicans (23%) to name dysfunctional government as the top problem. Gallup noted that this finding comes at a time when Congressional approval is within one percentage point of the lowest in history in its polls, (10% in February and August of 2012). The current standing of Congress is also significantly lower than during the 1995-96 shutdown period when it ranged from 30% to 35%. A Pew Research Center survey conducted in late September found that 26% of Americans were “angry” and another 51% “frustrated” at the federal government. About half (48%) of those surveyed said the main reason Congress can’t get things done was that the parties had grown so far apart, while 36% said the cause was a few members who refuse to compromise.